Previous studies have mainly focused on bat mortality through collision by wind turbines, and very few studies have assessed the indirect impacts on bat activity and on foraging habitat availability. Also, there is a global lack of knowledge on the vulnerability of tropical bat fauna due to wind energy production, even though it is well known that windpower can affect bat communities and biodiversity hotspots are widespread in the tropics. We present one of the first studies to quantify the indirect impact of wind farms on insectivorous bats in tropical hotspots of biodiversity. Bat activity was compared between wind farm sites and control sites, via ultrasound recordings at stationary points. The activity of bent winged bats (Miniopterus sp.) and wattled bats (Chalinolobus sp.) were both significantly lower at wind turbine sites. The result of the study demonstrates a large effect on bat habitat use at wind turbines sites compared to control sites. Bat activity was 20 times higher at control sites compared to wind turbine sites, which suggests that habitat loss is an important impact to consider in wind farm planning. We strongly recommend that the loss of the foraging habitat loss is considered in mitigation hierarchy (avoiding, reducing, offsetting) when compensating for negative impacts of wind farms. Global wind capacity grew by 16.1% between mid-2015 and mid-2016 (http://www.wwindea.org/2016/). 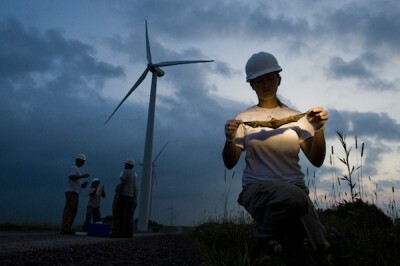 The wind energy industry is well known to impact biodiversity, mainly for birds and bats. The impacts are both direct, such as mortality due to collision or barotrauma (Rydell et al., 2010; Grodsky et al., 2011; Huso et al., 2016), and indirect: habitat loss, behavioral changes and reduced population viability (Zimmerling et al., 2013; Arnett and May, 2016; Frick et al., 2017). Yet various factors make it difficult to ascertain bat fatality rates (Zimmerling et al., 2013), while the indirect impacts are often overlooked (Minderman et al., 2012; Arnett and May, 2016). Today, while wind turbines are recognized to be one of the primary causes of bat mortality (O’Shea et al., 2016), it is still direct mortality that is principally assessed (Arnett et al., 2016; Schusteret al., 2015). Indirect impacts on bats include the destruction of habitat and roosts during the construction of the wind farm and behavioral changes caused during the operational phase (Arnett and May, 2016; Frick et al., 2017). Currently, only 4 studies (Barré et al., 2017; Millon et al., 2015; Minderman et al., 2012, Minderman et al., 2017) have dealt with the assessment of habitat loss due to wind farms or individual wind turbines. All these studies, carried out in Europe, reported a reduced bat activity within a wind farm compared to outside the wind farm. While most studies on the impact of wind turbines on bats come from Europe or North America (Arnett et al., 2016; O’Shea et al., 2016; Frick et al., 2017) a recent review (Arnett et al., 2016) highlighted the need to assess the vulnerability of tropical bat fauna. These assessments should be performed preferably before extensive wind facilities will be planned particularly because the ecological requirements and sensitivity to new human pressure are relatively poorly known, for the species involved. However, wind farm are already operational in tropical islands and many more installations are planned, in order to make such isolated territories energetically autonomous (Weisser, 2004). Our study aims to evaluate the indirect impact of wind turbines on bat activity in New-Caledonia. Using a paired-site design sampling, we compared bat activity measured in sites close to wind turbine to control sites (i.e. site outside the wind farm and including the same habitat cover). Bat activity was assessed using ultrasound recordings at stationary points New Caledonia is one of the world’s smallest biodiversity hotspots and hosts nine species of bat, six of them endemic (Myers et al., 2000). Of the Pacific islands, New-Caledonia has the highest electricity needs, mainly due to nickel mining (Hourçourigaray et al., 2014). In 2015, only 2% of its total energy demand was covered by wind energy, but new projects are underway in order to increase the part of renewal energy in the New-Caledonia electricity production (http://www.isee.nc/) thus assessment of wind turbine impact on wildlife is urgently needed. The two wind farms studied were localized on the summit of two Neo Caledonian medium mountain (up to 375 m high for Prony and up to 216 m for Mont Mau). The wind farms were made up by 66 wind turbines (Supporting Information 1), 31 of which were 50 m high, in operation since 2004–2005, and 35 of which were 55 meters high, in operation since 2006–2007 (Vergnet, 2016). Wind turbines were placed along the ridges of this mountain ((Supporting Information 1), on ultramafic soil with naturally low or no vegetation (http://explorateur-carto.georep.nc/explorateur-carto/). Remnants of forests and maquis vegetation are found in the valley (http://explorateur-carto.georep.nc/explorateur-carto/). To assess the potential disturbance from the wind turbines, we used a paired survey design to quantify bat activity at sites close to wind turbine (WT) and sites outside the wind farm (control). Each control sites was positioned in the vicinity of a site close to wind turbine (700 ± 140 m from the wind farm, minimum distance between a control site and a wind turbine was 170 m). Recorders (full-spectrum bat detector SM2BAT Wildlife Acoustics Inc. USA) at wind turbine sites were placed 15 m from the wind turbine. Microphones were placed 2.5 m from the ground. Two sites within a pair were 996 ± 210 m apart (238 m minimum). Upstream, we have paid a particular attention to ensure that control sites had similar altitude and habitat cover than WT sites (no significant difference was detected between WT sites and control sites: Wilcoxon test: W = 24, p-value = . 43 for the altitude, Kruskal test: ks = 2.649, P = .10; ks = 0.820, P = .37; respectively for forest cover in a radius of 200 and 1000m; Kruskal test: ks = 1.118, P = .29; ks = 0.365, P = .55; respectively for open land cover in a radius of 200 and 1000m). One or two pairs were sampled during the same night. To ensure the independence of the data, the minimum distance between two sampling points was 250 m. Eight pairs in total were sampled. Fieldwork was carried out during two periods: May-June 2015 (cold season) and November 2015 (dry season). Each pair was sampled once per period thus the dataset included 32 efficient recording samples. We used echolocation recordings at stationary points to sample bat activity, the most widely used method for a standardized insectivorous bat activity survey (Stahlschmidt and Brühl, 2012). We recorded ultrasounds higher than 8 kHz during the three first hours after sunset, with Song Meter 2 Bat detectors (http://www.wildlifeacoustics.com/). The beginning of the night was chosen because it is known to be when bat activity first peaks (Froidevaux et al., 2014; Griffiths, 2007; see Supporting Information 2). Focusing on the first three hours of the night also allows optimization of the time resources allocated to audio file analysis. We used Kaleidoscope (version 4.0.0, http://www.wildlifeacoustics.com/) and Scan’R (version 1.7.6, http://binaryacoustictech.com/) to isolate bat calls. All files labeled as containing bat calls were manually verified with Batsound (version 4.03, http://www.batsound.com/). Calls higher than 50 kHz were assigned to the genus Miniopterus, and calls between 30 kHz and 40 kHz were assigned to the genus Chalinolobus (Kirsch et al., 2002). In southern New-Caledonia, Miniopterus genus is composed of the little bentwinged bat (M. australis) and the small melanesian bentwinged bat (M. macrocneme), considered as least concern and as data deficient respectively (IUCN, 2017). Although the small melanesian bentwinged bat is believed to occur across a very wide range, the difficulties inherent in its identification prevent an accurate evaluation of trends and threats for this species. Locally, bentwinged bats are considered as vulnerable (Kirsch et al., 2002). Chalinolobus genus is only composed of the New-Caledonia wattled wat (C. neocaledonicus, Kirsch et al., 2002), a New-Caledonian endemic species listed as endangered (IUCN, 2017), due to a constant decline in the extent and the quality of its habitat. One other species, the New-Caledonia Long-eared bat (Nyctophilus nebulosus), an endemic critically endangered species (IUCN, 2017), may have been present in the study area (Parnaby, 2002) but was not detected in our recordings. As it is impossible to determine the number of individual bats from their echolocation calls, we calculated a bat activity metric (bat passes), calculated from the total number of contacts per genus during the three first hours after sunset. A bat pass is defined as a single or several echolocation calls during a five second interval (Millon et al., 2015). If it was obvious that several bats emitted calls at the same time, an additional contact was counted. Generalized Linear Mixed Models (GLMM) were used to assess variation in bat activity (i.e., the response variable) as a function of site type (WT versus control, the explanatory variable, R package glmmADMB, Fournier et al., 2012). Due to the nature of the data (i.e. : count data) and its overdispersion, we performed GLMMs (package glmmADMB) with a negative binomial error distribution (Crawley, 2009). Due to the difference in detection distance for Miniopterus and Chalinolobus, per genus modelling was performed. In view of the hierarchical sampling design (up to two pairs −i.e. a pair means one WT site and one control site – were sampled at the same date) and the repetition of the sampling during two seasons, we used a nested random effect: pairs within recording sessions and season. Since bat activity can depend on landscape variables, we add as fixed effect landscape co-variable: the percentage of open area (with little or no vegetation) and the percentage of forest area each calculated at 2 different buffers of 200 and 1000 m (http://www.oeil.nc/geoportail, see Supporting Information 3). where bat activity could be either Miniopterus or Chalinolobus activity. We performed variance-inflation factors (VIF) on each model (Fox and Monette, 1992). All variables showed a VIF value of < 3 and the mean of VIF values was <2, meaning there was no striking evidence of multicollinearity (Chatterjee et al., 2000). All analyses were performed with R statistical software (R Core Team, 2016). In total, more than 3 000 contacts were recorded at wind turbine sites (WT) and sites outside the wind farm, the majority of them emitted by Chalinolobus (80%). Both genera were present during the two seasons, with more contacts recorded during the dry season (72%) than the cold season. For both Chalinolobus and Miniopterus the landscape co-variable selected was the percentage of open area, with a significant negative effect. For both Chalinolobus and Miniopterus, wind turbines induced a significant difference in bat activity (Table 1, Fig. 1). The mean activity of Chalinolobus was tenfold lower at WT sites than at control sites (mean observed values: Control: 147 [min: 0–max: 790]; WT: 14 [min: 0–max: 120]; mean predicted values: Control: 265 ± 72; WT: 21 ± 4), while the mean activity of Miniopterus was, 20-fold lower at WT than at control sites (mean naïve values: Control: 39 [min: 0–max: 240]; WT: 2 [min: 0–max: 14]; mean predicted values: Control: 44 ± 11; WT: 2 ± 1) (Table 1, Fig. 1). The effect size of wind turbine presence was of the same magnitude than open areas. Note that the hierarchical structure or the landscape adjustment provided in our modelling did not change qualitatively naïve (i.e. observed) bat activity (see Fig. S2-1). Table 1. Results of the Generalised Linear Mixed Models (GLMM) of (A) Chalinolobus activity and (B) Miniopterus activity (number of contacts during first three hours of the night). All Estimates and Std. Errors are expressed with a log link due to the negative binomial distribution used in GLMM. Intercepts represent bat activity in control sites. WF represent the difference in bat activity between Control Sites and Wind Turbine Sites. Fig. 1. Prediction of Chalinolobus neocaledonicus activity (A) and Miniopterus spp activity (B) provided by the best model. According that the best model include the percentage of open land within 200 m buffer, we fix the value of this co-variable to its mean in the dataset (i.e. 42%). Bat activity is the number of number of contacts predicted for the first three hours of the night at control sites and wind turbine sites (WT), error bars are standard error. This study showed that the activity of two genera of bat species present in New-Caledonia were significantly lower at wind turbines as compared to nearby control sites, and confirmed the displacement effect of the wind farms on foraging bats. Apart from reported bat fatalities in south Australia, there has been no previous attempt to determine to what extent wind turbines impact Oceanian bat populations (Bennett, 2012; Hull and Cawthen, 2013). Here, we showed that Chalinolobus activity was tenfold lower under wind turbines, and Miniopterus activity was 20-fold lower. To our knowledge, this is one of the first studies quantifying the indirect negative impact of wind turbines on bat activity in the tropics. Although our results were obtained in a tropical biodiversity hotspot, similar results of a displacement effect of wind turbines y have been found in temperate zones in agricultural landscape characterized by open landscape (Barré et al., 2017; Millon et al., 2015; Minderman et al., 2012, Minderman et al., 2017). The lower attractiveness of the foraging habitat under wind turbines, both in a tropical and in a temperate climate, indicates that the indirect impact of wind turbine is a worldwide phenomenon. In a biodiversity hotspot such as New-Caledonia, species face many threats, such as habitat loss and alteration (nickel exploitation, logging, fires), agriculture, hunting, cave disturbance, severe storms and invasive species (e.g. cats, Wiles and Brooke, 2009; Bonvallot et al., 2012). Here, we provide evidence showing that two genera of insectivorous bat species are also threatened by wind farms. Future studies should also assess the impact on megabats. Few studies have focused on bat species in New-Caledonia, mainly on endemic species (Parnaby, 2002; Bonvallot et al., 2012). This is the first study showing that insectivorous bats visit ultramafic environments with naturally low or no vegetation, maquis vegetation or remnants of forests. Island bats represent 60% of bat species worldwide and the highest proportion of terrestrial mammals on isolated islands, including numerous endemic and threatened species (Fleming and Racey, 2009). In addition, wind turbines are a part of alternative energy production that does not contribute to greenhouse gas emissions. In the context of sustainable development of islands the number of windfarm is expected to increase in the future. It is therefore vital for environmental managers to take into consideration the impact of wind turbines, to ensure bat conservation. 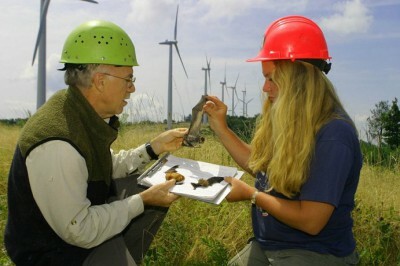 Eurobat guidelines for consideration of bat in wind farm (Rodrigues et al., 2008) advocate that, for the consideration of bat in wind farms planning, conservation managers need to determine the impact of a wind facility by comparing activity before and after its establishment, within and outside the wind farm, for at least three years after set-up. We strongly recommend that the loss of the foraging habitat due to wind farm avoidance is considered potentially a significant threat to bat conservation, and involve specific studies as suggested by Kingston (2008) and more particularly during environmental impact assessment (EIA). Indirect effects not only impact the bat’s nature heritage value, but also their value in terms of providing ecosystem services, such as pest control (Cleveland et al., 2006). The displacement effect of wind farms on bats, could be more general to other taxa as suggested by Kuvlesky et al. (2007) that highlighted that bird populations might be more threatened by habitat loss associated with wind farm development than direct impacts. We strongly recommend that the loss of foraging habitat due to wind farm avoidance is considered in mitigation hierarchy (avoiding, reducing, offsetting impacts) in order to compensate for this negative impact from wind turbines. Loss of the foraging habitat due to wind farm avoidance, could be offset through enhancing the carrying capacity of the habitat (via the creation of ponds, corridors between forest patches, or hedgerows and fallows in the farming landscape, Millon et al., 2015; Peste et al., 2015). Despite some opportunities of offsetting, in the context of island biodiversity hotspots, stronger guarantees should be employed, because bat populations are often small and isolated and sometime concern endemic species (Myers et al., 2000). While switching off turbines at low wind speeds has been shown to be an effective means to reduce bat mortality (Martin et al., 2017), it is however necessary, before considering such reduction measures to assess their effectiveness on bat activity. No choice at all: for bats it’s either flee the field or perish. As I have been time poor recently I have only just read this article and Melissa is absolutely right Environmental concerns are being swept under the carpet. The EPBC appears to be complicit with the push for Turbines above concerns for the environment. The Southern Bent Winged Bat is listed as Critically Endangered, with a presence in SW Victoria and SE SA. These two groups while the same specie are believed not the interbreed though it has been recorded some do occasionally take a flying ‘holiday’ to visit the others sites. The above research is an important step into understanding effects of these massive wind turbines intrusion on Bats, but it does not appear to include research into how the infrasound from these turbines can affect breeding inside of breeding caves. The vibrations from the noise travelling through the ground can and I would suspect does intrude on bats resting or breeding inside of caves. The Southern Bent Winged bat like other bats ‘shut down’ while sleeping with the result that normal awakening takes a little time, but sudden shocks from noise (or light) can cause them to attempt to waken quickly causing a ‘shock’ response. This alone can cause bats to die from stress. So how do they manage with almost constant vibrational ‘sound’ from turbines travelling through the rocks inside caves they roost from? Does the noise and changed wind movement from the blades while foraging cause them to loose direction in flight? Questions that should be answered before turbines are installed – but inevitably the EPBC does not insist on this type of research/investigation taking place to ensure the continued existence and health of this specie. There are two known breeding cave sites for this particular bat one in Victoria near Port Fairy and one in SA near Naracoorte both have turbines proposed for the areas – where is the research being undertaken? Where are the State and Federal Governments demands for this research BEFORE turbines are installed? Nowhere because Bats are not considered more important than turbines even though Bats are extremely important to successful environments and eco systems. No-one has investigated the vibrational, sound or blade impacts of the Cape Bridgewater Wind farm on the nearby bats or to the bat caves dotted around the cliffs of the Cape itself. I have noticed a decline and absence of bats during the wind farms ten years intrusion. It is too easy and an accepted practice now for developers and planning panels to conclude minimal impacts on flora and fauna. Environmental concerns are being strangely swept aside by bird ‘compensation’ type packages with little or no monitoring of the post wind farm impacts on locales.